Amphu lapcha pass trekking including Mera peak and island peak climbing is the challenging adventure trekking trip in Everest Himalaya region. Since Amphu lapcha pass trekking trail has been open Himalaya Journey Treks & Expedition operate numerous trekker / mountaineers with memorable experience in Himalayas. Mera peak climbing and Amphu lapcha pass trekking required the use of technical climbing equipment and trekkers must be skilled in the use of this and be prepared. Mera peak climbing and Amphu lapcha pass trekking holds the views of Himalayas and hearty scenery of lakes Hongu valley. Mera peak 6421m is highest trekking peak in Nepal and island peak is one of the popular trekking in Everest region. 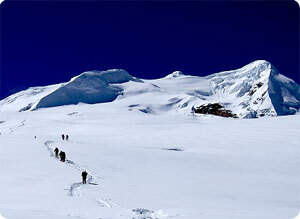 Mera peak climbing and Amphu lapacha pass trekking offers superb Himalayan scenery including the Mt. Everest, Mt. Lhotse, Mt. Nuptse , Mt. Amadablam , Mt. Makalu , Mt. Baruntse , Mt. Thamserku, Mt. Kusum Khangaru and other Nepal trekking peak. After a spectacular mountain flight from Kathmandu, our trek will begin by heading southeast from Lukla or Kathmandu by bus drive to Jiri if trekkers/ climbers has long holiday duration for Nepal Himalaya. We will walk along a high rocky ridge through dense forests and across several streams before reaching the pass that will take us from the Khumbu into the Hinku Valley. Trekking and camping in this wild land of abundant rhododendron and Himalayan pine forests is indeed an impressive experience. At Tangnag, we will rest and explore the huge moraine and the beautiful glacial lake north of the village. We will have the option to climb Mera Peak, first climbed in May 1953. We will continue north through the uninhabited Hunku Valley with constant views of magnificent mountains. After several days camping beside the lovely lakes Dudh and Panch Pokhare we'll climb over Amphu Lapcha (5778m). We will make our way to Dingboche, then Lobuche and along the moraine to the base of Kalapater (5544m). You will have the option of climbing this "Black Rock"- Kala pattar for a panoramic view of some of the world's highest mountains. As we make our way back to Lukla via Namche Bazaar and Phakding, you will have completed one of the more demanding trekking routes in Nepal. Highest access of the trek: Amphu Lapcha 5778 Meters. Himalayan sights: Mt. Everest, Mt.Lhotse, Mt. Nuptse , Mt. Amadablam, Mt. Thamserku, Mt. Pumori, Mt.Kantega, Mera Peak, Island etc. Day 03: After breakfast, Lukla trek to Chhutanga. O/N Tented Camp. Day 04: After breakfast, Trek to Tuli Kharka. O/N Tented Camp. Day 05: After breakfast, Trek to Mousum Kharka. O/N Tented Camp. Day 06: After breakfast, Trek to Tagnag. O/N Tented Camp. Day 07: Rest and acclimatization day at Tagnag. O/N Tented Camp. Day 08: After breakfast, Trek to Khare. O/N Tented Camp. Day 09: Rest day at Khare preparation for climbing. O/NTented Camp. Day 10: After breakfast, Trek to Mera high camp. O/N Tented Camp. Day 11: Wake up early in the morning for Climb Mera Peak and return to Khare. O/N Tented Camp. Day 12: Spare a day for climbing in case of bad weather. O/N Tented Camp mera peak base camp. Day 13: After breakfast , Mera peak base camp trek to Rato Ordar (5000m). Day 14: After breakfast , Rato Ordar trek to Chamlang Base Camp (4700m) Camp. 17th September 2008 Day 15: After breakfast , Chamlang B.C. trek to Seto Pokhari (4900m). Day 16: After breakfast , Seto Pokhari trek to Amphulapcha Base Camp (5200m) Camp. 19th September 2008 Day 17: After breakfast ,Amphu lapcha Base Camp to over pass (5800m) camp in Chhukung Valley Camp. Day 18: After breakfast , Chhukung trek to Island peak base camp, our climbing guide will teach you how to fixed the rope and climb. O/N Tented Camp. Day19: early in the morning , our climbing guide will take for island peak (6179m) summit and back to Island peak base camp. O/N Tented Camp. Day 21: After breakfast , Chhukung trek to Tyangboche 3890m. Overnight at Tyangboche. Day 22: Tyangboche trek to Namche Bazaar 3480m. overnight at Namche Bazaar. Day 23: Namche Bazaar trek to Lukla 2830m. overnight at Lukla. Day 24: After breakfast , Lukla by flight back to Kathmandu , transfer to hotel and Overnight at Kathmandu . Day 25: After breakfast, our tour guide will take to for historical monuments sightseing in kathmandu valley such as Bhaktapur, Pasupatinath, Boudhhanath, Kathmandu durbar square and Monkey temple(swyambhunath) and in the evening farewell dinner in Restaurant, overnight at kathmandu in Hotel. Day 26: After breakfast, relaxing, shopping or short sightseeing around Kathmandu valley than Himalaya Journey Trekking and Expedition airport representative drop to Kathmandu international airport for onward journey. Day 21: After breakfast, Chhukung hike to Chhukung ri for superb Himalayan scenery including Mt. Everest 8848m, Mt Lhotse 8516m, Mt. Nuptse 7855m, Mt. Amadablam 6856m, Mt. Thamserku 6723m, Mt. Kantega 6685m, Mt.Kusum Khagaru 6367m,Mt.Kongde 6011m,Mt. Khumbila 5761m(God of the Khumbu),Mt.Twache peak 6367m, Mt. Cholaste 6335m ,Island peak 6179m, Lobuche peak 6145m,Pokalde peak 5806m, Honku south peak 6119m back to Chhukung and trek to Dingboche 4345m. overnight at Dingboche. Day 22: After breakfast, Dingboche trek to Lobuche 4910m. overnight at Lobuche. Day 23: Lobuche to Gorakshep 5180m approx 2-3 hours, lunch at Gorakshep then trek to Everest base camp and overnight at Gorakhshep. from Lobuche to Gorakshep and Gorakshep to Everest base camp 4-5 hours. Overnight at Gorak shep. Day 24: Gorakshep early in the morning hike to kala pattar (5545m) walk approximately 1:30 minutes, for superb Himalayan views including the Mt. Everest 8848m, Mt Lhotse 8516m, Mt. Nuptse 7855m, Mt. Pumori 7161m, Mt. Changaste 7550m, Mt.Lingterin 6679m, Mt. Amadablam 6856m, Mt. Thamserku 6723m, Mt. Kantega 6685m, Mt.Kusum Khagaru 6367m,Mt.Kongde 6011m,Mt. Khumbila 5761m(God of the Khumbu),Mt.Twache peak 6367m, Mt. Cholaste 6335m ,Island peak 6179m, Lobuche peak 6145m,Pokalde peak 5806m, Honku south peak 6119mback to Gorakshep, breakfast at Gorakshep, continue trek to Pheriche. overnight at Pheriche 4250m. Day 25: After breakfast , Pheriche trek to Tyangboche 3890m. Overnight at Tyangboche. Day 26: Tyangboche trek to Namche Bazaar 3480m. overnight at Namche Bazaar. Day 27: Namche Bazaar trek to Lukla 2830m. overnight at Lukla. Day 28: After breakfast , Lukla by flight back to Kathmandu , transfer to hotel and Overnight at Kathmandu . Day 29: After breakfast, our tour guide will take to for historical monuments sightseing in kathmandu valley such as Bhaktapur, Pasupatinath, Boudhhanath, Kathmandu durbar square and Monkey temple(swyambhunath) and in the evening farewell dinner in Restaurant, overnight at kathmandu in Hotel. Day 30: After breakfast, relaxing, shopping or short sightseeing around Kathmandu valley than Himalaya Journey Trekking and Expedition airport representative drop to Kathmandu international airport for onward journey.